Services and infrastructures: Driving range, putting green, chipping greens, pro shop, golf academy, health SPA, restaurant and snack bar. Address: Quinta da Boavista, 8601-901 Lagos, Portugal. Address: Apartado 74, 8601-901 Lagos, Algarve, Portugal. Services and infrastructures: Driving range, chipping green, practice bunker, putting green, golf academy, pro shop, tennis, restaurant and bar. Address: Po Box 146, Penina, Portimao, 8501-952, Portugal. Services and infrastructures: 2 Practice tees, 2 chipping greens, 2 putting greens, golf academy, restaurant, bar, clubhouse, pro-shop, buggies, trolleys. Address: Morgado do Reguengo Resort, 8500-000 Portimão, Algarve, Portugal. Fairways: Penn A4 at Greens, Fescue at Rough, Tifton 419 at Tees and Tifton 419 at Fairways. Fairways: Paspalum at Greens, Bermuda grass at Fairways. 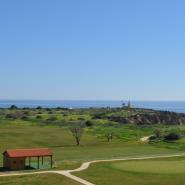 Services and infrastructures: Driving range, putting green, pro shop, restaurant, bar. Address: Apartado 477 8601-906 Lagos Algarve, Portugal.